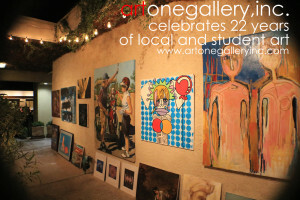 Representing local and student artists since 1993. Kraig Foote was born on April 5th, 1963 in Scottsdale, AZ. As a young man, Kraig attended Coronado High School, as his father was head of the math department at the time. Through a bit of teenage angst, he barely made it through High School with an eventual boot out the door from Mr. Foote’s colleges. During high school, Kraig scored a job at “By George!” a house ware and novelty shop. After being hired by Pam Delduca, who also owned the Häagen-Dazs on 5th Ave and Marshall Way at the time, made Kraig the first manager of her new ice cream joint. Kraig also had jobs in real estate, jewelry, a local punk-rock band, a personal assistant to Michael Roach (one of the two founders of America West Airlines), and The Arizona Design Center. Here, Kraig was able to explore his designing skills, and his apparent unknown love for the art scene. After a few years in the industry, Kraig decided to start something new. During the middle of the night, in 1992, Kraig woke up and had a revelation: Start an art gallery for students and local artists. This new calling left Kraig eager to give these young artists a safe place for free expression. Including, fostering 15+ underprivileged students in his own home. Kraig also started a non-profit organization called “The Newlon-Foote Foundation” which provides supplies to students who cannot afford the high prices of such items. Art One then ventured overseas for a five-year non-profit student gallery project in Zurich, Switzerland, which was so graciously funded by a long-term Swiss client. Throughout the years, hundreds of artists and people have been inspired by Kraig’s mission and have flourished beyond expectations. After 22 years of continued support, the Art One community has been able to affect thousands of lives from all over the globe.